I hope you’re ready for another walk down memory lane cause today I incidentally threw something together for dinner that strongly reminded of my all time favourite childhood dinner. 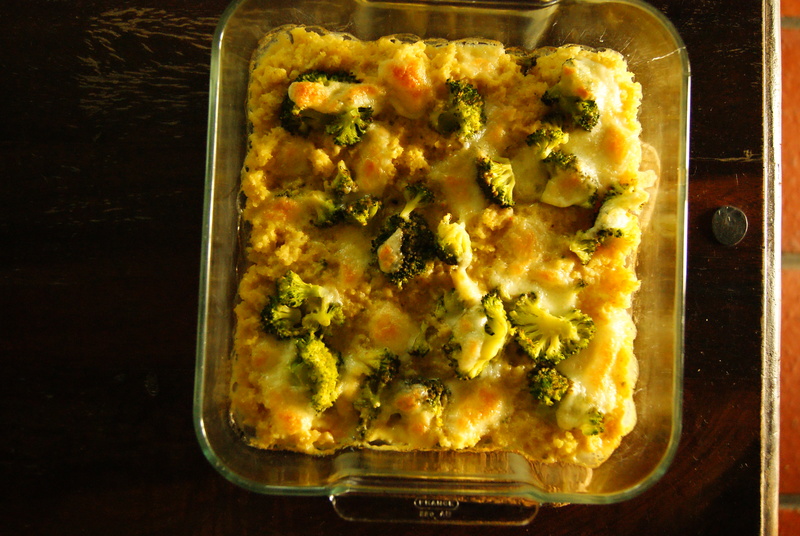 Oven dish with potato mash, broccoli, minced meat in a cheesy sauce covered with grated cheese. I swapped mashed potatoes with millet. I swapped the cheesy sauce with a broth-hummus sauce. 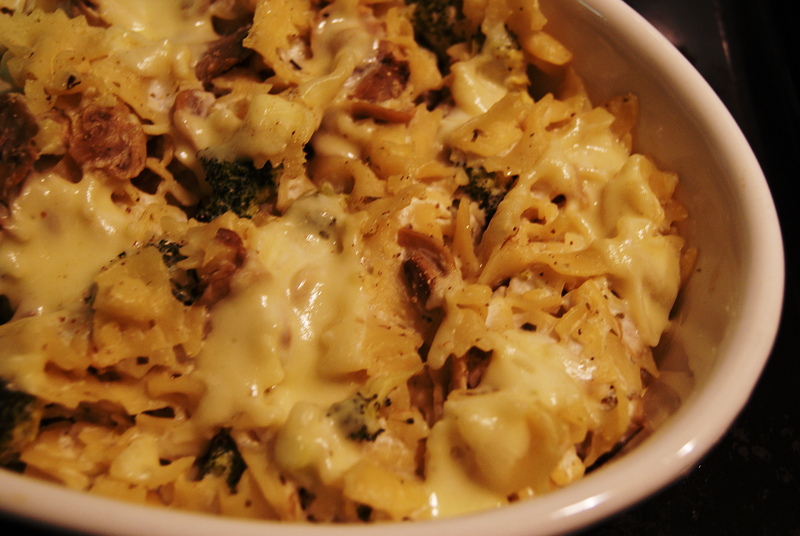 I swapped the grated cheese with mozzarella. The broccoli stayed as it always was and I didn’t use anything to replace the minced meat but you could always use vegetarian ‘mince’, lentils or minced meat for the carnivores among us. Just prepare it in a skillet and add it to the rest of the ingredients when you put it in the oven dish. 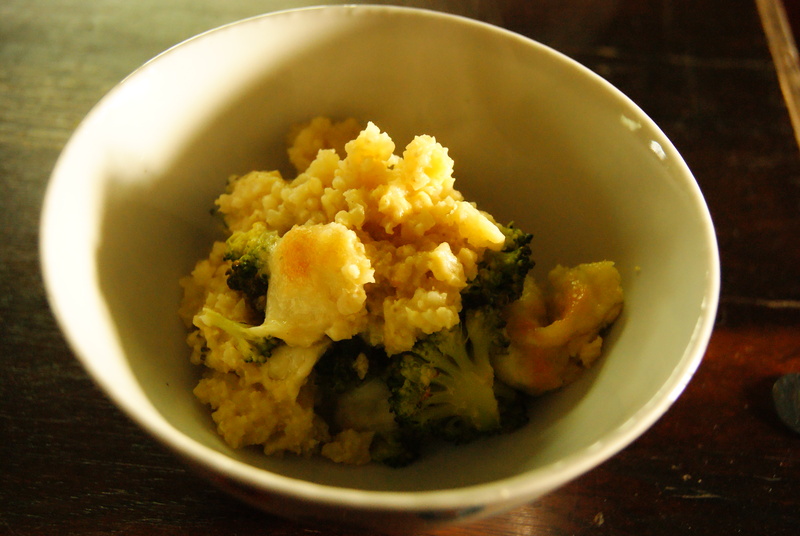 Cook the millet in vegetable broth (ratio 1:2.5) for 25 minutes. I don’t really know how much millet I’ve used, I used a little teacup at home to measure it out, not that this information is of much use to you. Just use what you think is the proper amount for 2 people to eat from. Once done take it of the fire and let it sit for another 5 minutes. Cook the broccoli until tender (about 5 minutes), prepare the sauce with about 100ml of vegetable broth, whisk in the two T of hummus. Preheat oven to 200°C (390 F). 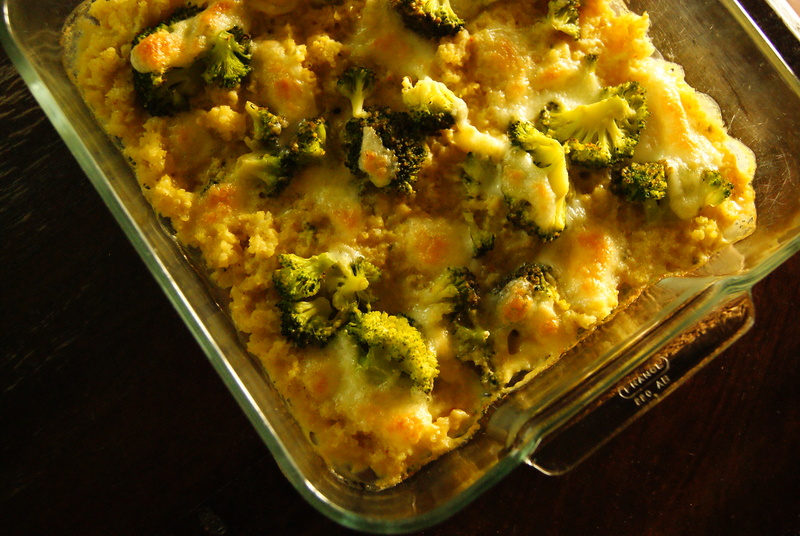 Layer the oven dish with the millet and broccoli, pour the sauce on top and top with about half of a mozzarella bowl. Put in the oven for about 20 minutes, make sure to turn on the grill for the last 5 minutes so the mozzarella will get some colour. Eat from a bowl, because all classy people eat their dinner out of breakfast bowls! 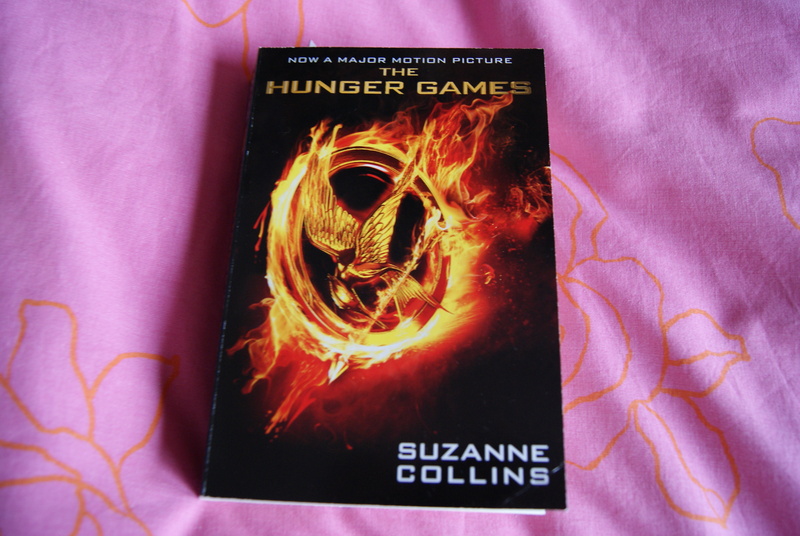 I finally got my hands on a Hunger Games edition! I’ve been looking for these series for over a year, but they could not be found anywhere in Belgium. Thank god for the people who decided to make a movie out of it, otherwise I might have never found the book at all. I finished this book in two days. It where busy days filled with classes and social ‘events’ but I just had to read every spare moment I had! I can’t wait to see the movie but most of all I can’t wait to read the rest of the series. Locating them will be another problem I guess ;). Now I’m off to study for a while,work on a paper and prepare dinner. I’m taking another yoga class tonight as yesterday’s noon class was really invigorating and I’ve finally come to the point that I can walk down the stairs and not feel every muscle in my body aching the days after that type of yoga class. I am keeping it low key with an easy flow class though, one ashtanga class a week is plenty for now. With Daphne staying with my dad for the weekend, Friday night was the perfect time for me to prepare my ‘fancy’ couscous idea for my mum and me. So we cracked open a bottle of red wine and I put together this amazing dinner, which as a bonus is also really easy and not time consuming at all! Place the couscous in a large bowl (I used half a cups for my mum and me, but still had leftovers the day after), pour boiling water on top of this (ratio 1:1) and let it sit for a couple of minutes. Chop up the mushroom and sauté them in some olive oil in a skillet. Chop up the sun-dried tomatoes and the mozzarella. 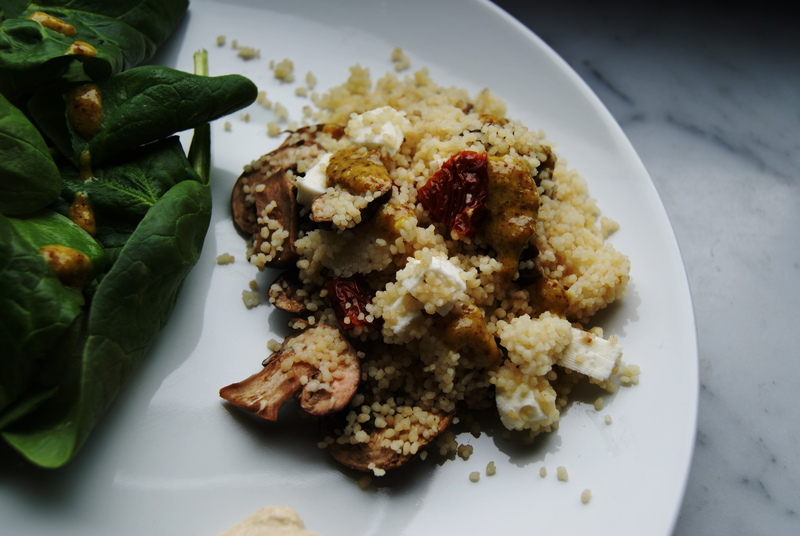 Fluff the couscous with a fork and add the tomatoes, mushrooms and mozzarella. At this point you can also sprinkle some olive oil on top, or use some oil from the container of the sun-dried tomatoes you used to get some extra flavours in there. Don’t forget to season before you serve this. My original plan was to serve the couscous with a dollop of hummus (which tasted amazing as well), but as a side for the couscous I prepared a spinach salad with a mustard maple syrup dressing and as soon as I tried this dressing with the couscous I was in heaven! 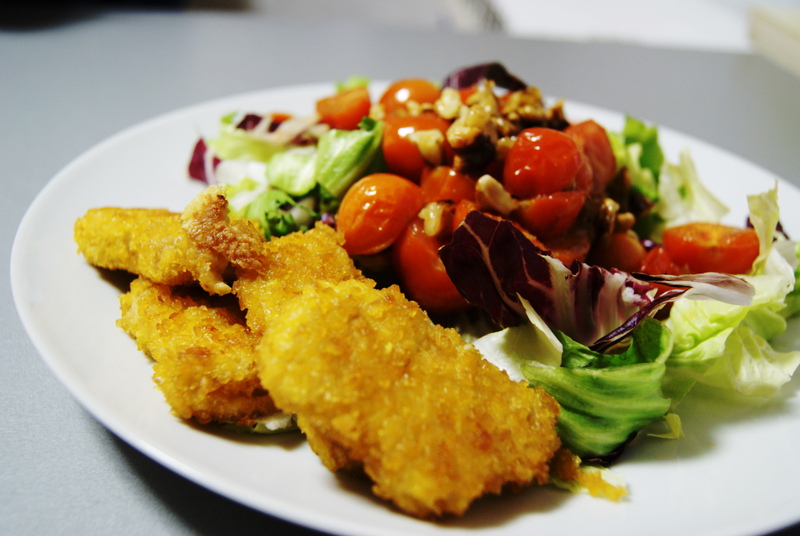 Prepare the dressing by stirring together 1 T of very spicy mustard, 1 T of olive oil and a drizzle of maple syrup. Drizzle on top of the couscous, sprinkle with some lemon zest and prepare to be dazzled. I’m falling in love with potatoes all over again. I haven’t been too fond of potatoes these last couple of months. When we were kids potatoes where the staple food in our house, dinner typically consisted of some kind of potato with veggies and meat. So it’s safe to say I have had my fair share of potatoes in my youth. Last Sunday however I couldn’t resist trying to make some crispy, salted oven potato wedges and they immediately converted me back into a potato lover. I’ve done another potato experiment yesterday and it turned out amazing as well! Peel the potatoes and the parsnip, grate them. 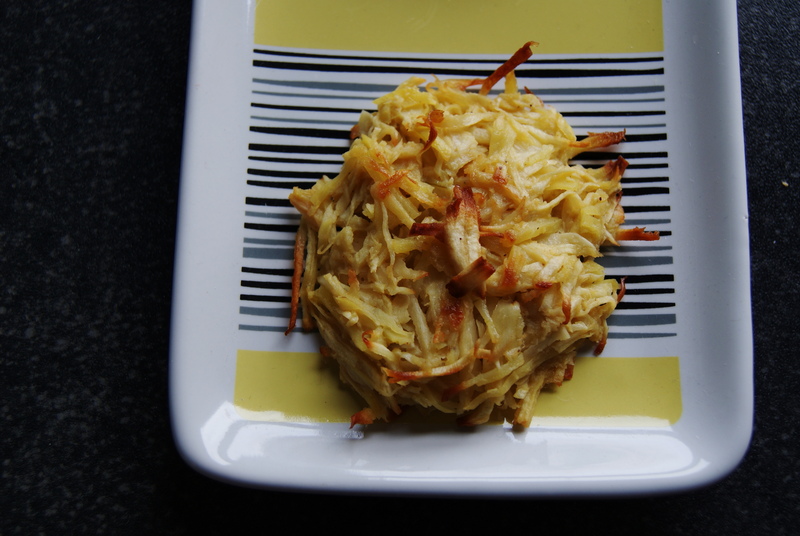 Chop the onion and the garlic, add them to the grated potato and parsnip. Add the egg and the herbs as well. You can also add some grated cheese at this point, I didn’t do this in my first try but I bet they would taste even more amazing with some cheese in there. Mix everything together with your hands. Preheat the oven to 180°C (360 F). Line a cookie tin with wax paper, sprinkle some olive oil on top and spread it out with a small brush or a paper towel piece. Bake them for 20 minutes on 180°C (360 F),followed by 10 minutes on 160°C (320 F). Don’t forget the flip them over after 15 minutes. You could also bake them in a skillet in some olive oil, when they are done you can keep them warm in an oven on about 140°C (280 F). I can’t get enough of the oven in my mum’s new house! We used to have a microwave and oven in one and I always thought that was an amazing invention, two functions in one machine how can’t that be great?! But now we have an oven an sich and it just works so much better!! So lately I’m on a grilled veggies kick, I’ve already made a various array of grilled veggies for almost every dinner, my favourites so far are grilled zucchini and grilled broccoli with mozzarella on top. 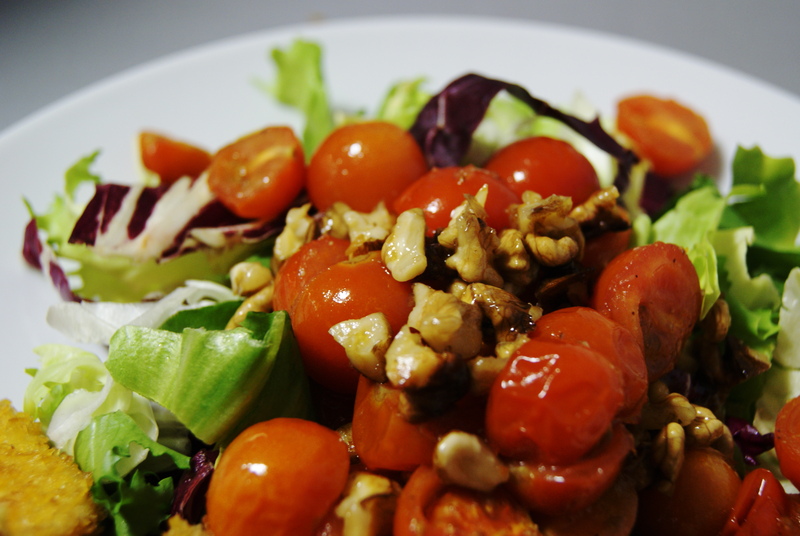 Slice the cherry tomatoes in half, place them in an oven proof dish with the walnuts. Heat the honey in the microwave for a minute (or 2), add the olive oil and mix this. Pour the mixture on top of the tomatoes and nuts. Place in the oven for 15 to 20 minutes, grill them in the last 5 minutes. This tomatoes make an amazing side or salad topping. Bonus points because you’ll have topping and dressing all in one. Don’t let any of that dressing go to wast, I’m serious about this, you should just have a nice ciabatta with this and let the bread soak up the liquid you can’t get out of the oven dish. I’ve also noticed I’ve been craving “meat” these last couple of days. Mind the quotations marks, cause I’ve actually been craving extra protein and meat-structure-things not the actual meat. I haven’t had any meat replacers in ages so today I enjoyed some soy nuggets and they really hit the spot, so good! By now you probably know I like to eat my food out of bowls, well I also like to prepare my dishes in one big oven dish or in one casserole, it just seems much cosier. Cook the farfalle in salted boiling water, follow the directions on the package. Clean the broccoli and cook in boiling water for 5 minutes as well. Slice the mozzarella and zucchini in small slices, slice the mushrooms as well. In an oven dish, layer the zucchini until the bottom is covered, add a layer of mozzarella (half of it, you’ll need the other half later), put this in an oven on 200°C (390F) for 5 to 10 minutes. In the meantime pour some olive oil into a hot skillet (make sure it’s big enough!) and fry the mushrooms and the broccoli. Add the cream cheese and some milk.This will be the sauce for the pasta, when the farfalle is done you can add it to the sauce. When your zucchini and mozzarella has been in the oven for 5 to 10 minutes, get it out of the oven and top it with the pasta mixture. Cover with the rest of the mozzarella and place it back in the oven for about 15 minutes. There is no way on earth you will ever guess what I had for lunch today! What did you say? Spring rolls?? Why, you’re good, how did you know? Okay, enough with the sarcasm already, cause you really won’t be able to guess what I’ll be having for dinner. 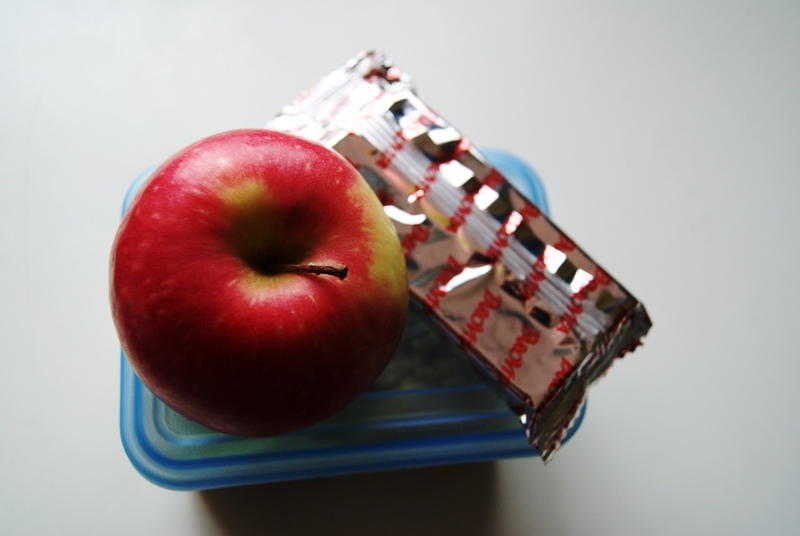 Thus far it looks pretty standard: apple ,crackers and a box with an undefined content (and some leftover khaki, but it’s still in the fridge for now). Just wait till you open the box! On the left: Greek yoghurt with spinach and kiwi (it’s a crazy dinner on the go favourite) with flax, almonds and dried berries. 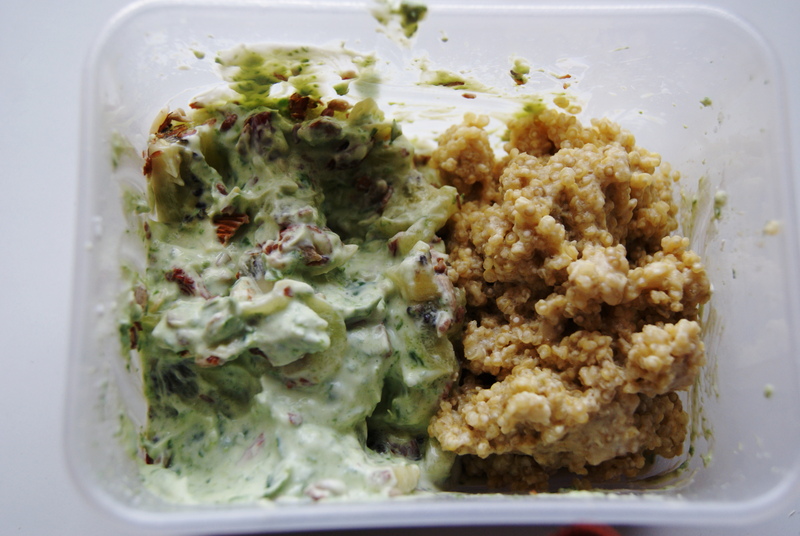 On the right: quinoa cooked in soy milk. It looks really horrible, but the flavours are great. When I’m home tonight I’d still like to go for a run, so I hope this is enough to hold me over for some time.